FREE ITIL Training on You Tube This is the perfect starter kit to become familar with not only ITIL concepts but also the certification programs associated with the ITIL. The itSM Solutions ITIL training guide provides students with a comprehensive overview of the ITIL along with the certification programs associated with this best practice framework. 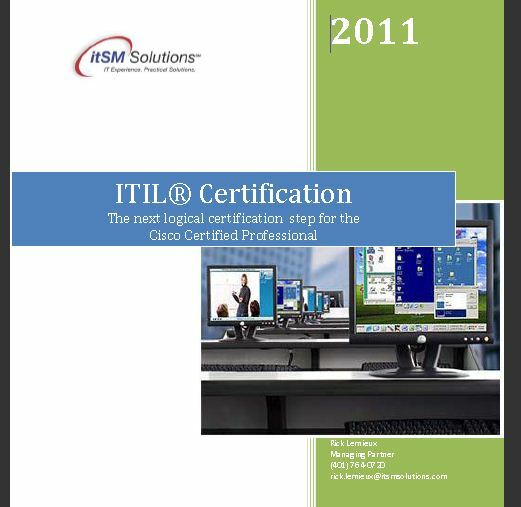 This white paper introduces the Cisco Certified Professional to the world of ITSM and ITIL along with providing some guidance in the areas of adding an ITIL certification to ones Cisco certification portfolio. The ITSM Practitioner Alliance is a network of ITSM Practitioners willing to share their ITSM implementation and operations experience. 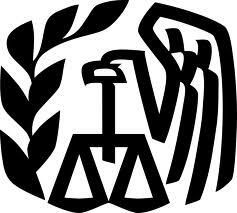 The Internal Revenue Service (IRS) shares its ITIL training journey with ITIL’s Accreditor APMG. 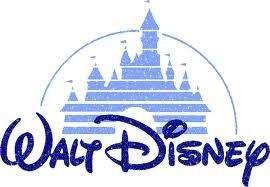 Disney shares its ITIL training journey with ITIL’s Accreditor APMG. 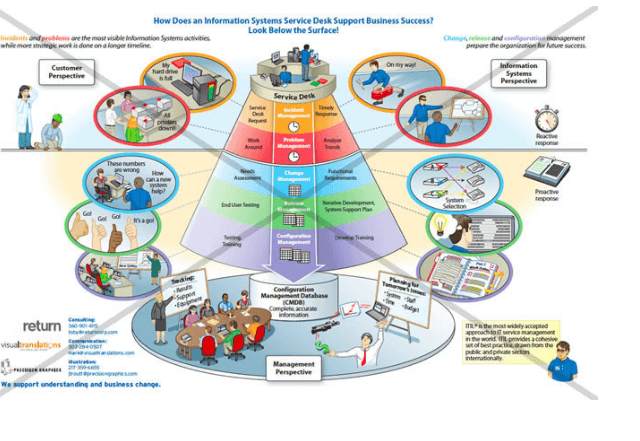 ITIL in Action Posters & Diagrams Bring your ITIL program to life through the power of visual graphics. Contact rick.lemieux@itsmsolutions.com for more information. A Meta-Analysis and Review of Online Learning Studies completed by the U.S. Department of Education Office of Planning, Evaluation, and Policy Development Policy and Program Studies Service. DITY™ is our unique and leading edge “Do IT Yourself” philosophy for IT Service Management (ITSM). DITY™ guides are for IT professionals looking for practical coaching and advice on how to implement IT Service Management best practices. Through DITY™ you can acquire good practical advice on how to manage, organize, and optimize IT. DITY™ guides complement our exclusive Mentor Led Approach to ITSM Training. Learn how to “Do IT Yourself” and uncover the hidden power within you and your team. We’ve all watched action/adventure films where the “bad guys” jump out from behind cover and open fire with their automatic weapons pointed in the general direction of their opponent. In the vernacular, this is referred to as “spray and pray.” This behavior is related to the Principle of Evil Marksmanship, which says that enemy soldiers in action films are often very bad shots and almost never harm the main characters. The major difference is that the later are highly trained, but just bad shots. Thinking back to your college days, did you ever wake up in a panicked state the night before an exam with a thought racing through your brain that you had forgotten to study something – perhaps you had not bought and read the course textbook! Wouldn’t it be nice if just attending a class or viewing an online training course were all you had to do to successfully pass one of the ITIL® V3 Intermediate- or Advanced-Level exams? No matter how good any of itSM Solutions’ (or any other ITIL course provider’s) classes are, YOU still are responsible for preparing yourself to successfully sit for the exam. It’s a frequent scenario. Your organization has done the feasibility studies and the analyses, defined an ITIL implementation plan, and established a budget to bring your staff up to the appropriate level of ITIL® training and certification. In an October of 2009 itSM Solutions published an article from Kepner Tregoe asking the question Is The Training Room Defunct? The article focused on the fact that in-class training was dying a rapid death in many organizations, not out of any ill will but primarily out of economic necessity and directives to minimize an employees’ time off the job. With that in mind, education coordinators have been seeking new ways to deliver “just in time” education solutions that will help workers solve problems, learn new skills, prepare for examinations and receive support services on-demand. On-Demand Classroom Education Networks may deliver what coordinators are looking for. The convergence of three trends – high-speed internet access, new technical education requirements, and time and budget restrictions – make Remote Learning an attractive item on anyone’s on-going education budget. In today’s businesses, two things are certain: first, Information Technology is core to most corporations and second, the fast pace of business change makes the services they require moving targets. The demand for coordinating these services across business value chains, functions, markets, and geographies will continue to accelerate, and it will be impossible to respond to this challenge without driving new ways of thinking and doing into the IT department. IT Service Management (ITSM) and IT Cloud Management (ITCM) represent emerging frameworks and methods that will enable IT to more quickly and efficiently respond to their customer’s needs. What ITIL Training & Exam Delivery Method is Right for You? 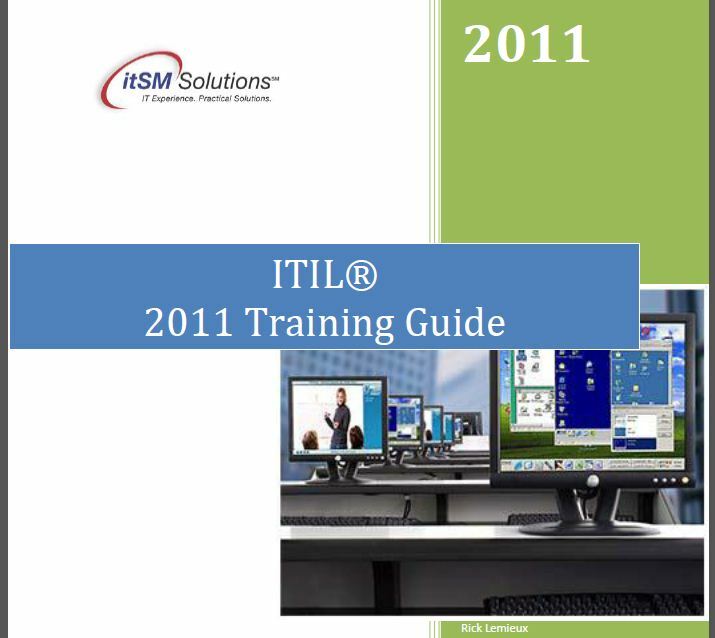 The world of ITIL training & testing has changed quite a bit over the past two years. Today, one can be trained from Foundation thru Expert in an instructor led classroom, virtual classroom, online self-paced video or e-learning classroom or in a blended learning classroom that combines self-paced training with instructor-led review sessions. Exams can be taken onsite with a proctor, online with a web cam proctor or at an accredited testing center. These new multi-venue delivery and testing capabilities provide training coordinators with the ability to maximize the use of their ITSM training dollar while minimizing their travel cost and a student’s time out of the office. This multi-venue approach also provides the ability to accelerate ITSM adoption within an enterprise by enabling training coordinators to offer solutions that can be delivered anytime, anywhere. This newsletter is designed to help training coordinators understand each delivery method in detail so they in turn can use this new found knowledge to assist in the development of multi-venue training plan for individuals or an entire IT organization. The process of selecting an Examination Institute(EI’s) to sit for an exam has changed with the introduction of ITIL V3. Like ITIL training providers, examination institutes are now operating in the amazing world of multiple delivery formats which include classroom, virtual classroom, self-study classroom and blended classroom training models. The IT Infrastructure Library (ITIL) is an IT-thing. 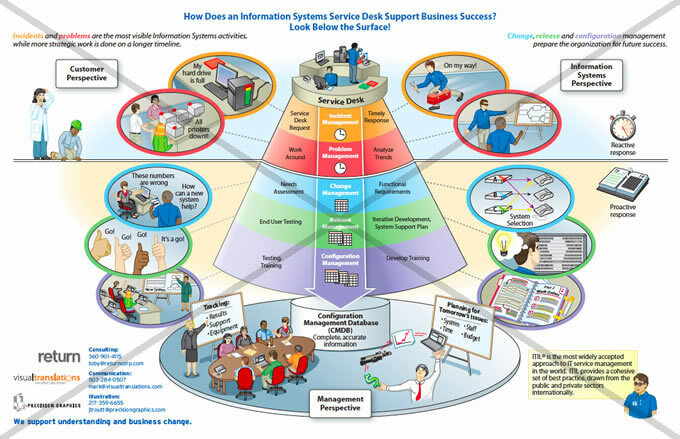 Yes, I know it benefits the business, but ITIL is inherently a set of IT workflow processes. Non-IT people, even well educated non-IT people (read senior executives with control over the purse strings) often dont understand what ITIL represents. Is The Training Room Defunct? One of the greatest challenges that training and organization development professionals face is the demand on the part of their organizations for a minimization of employees’ time off job. Our own research shows that while there is a higher focus on the time and attention spent on developing capabilities across all levels of operation, that time and attention is not in the classroom. Have you ever prepared a meal for the first time, taught yourself to repair something, assembled toys at Christmas or learned how to use the cool new features on your iPhone? Of course you have. Almost everyone, at one time or another has assumed the responsibility to learn something new and to work their way through the assembly manuals, training videos, and support systems available to achieve operational success. ITIL training and certification has become a virtual requirement for IT professionals looking differentiate their skill sets to hang on to their jobs or compete for a new one. The days of leveraging a technology certification as your ticket to employment are over. The days of flying to exotic locations to get trained by your favorite instructor/consultant/mentor are over. Let’s face it, with the economic downturn in full swing and training budgets shrinking, we are all looking for new ways to acquire the education we need to deliver the value our current (or future) employer expects from us. Imagine the following scenario. You are a senior-level IT Service Management (ITSM) consultant with many successful ITIL process implementations under your belt. An enterprise IT organization recognizes the potential benefits of ITIL. It also recognizes that ITIL is not a ‘plug and play’ project due to the many dynamics of organizational goals, priorities, leadership, maturity, etc. Thus, it has retained you to counsel its IT leadership team as it begins its transition to the process-driven ITSM Lifecycle. Today’s multi-faceted business world demands that Information Technology provide its services in the context of a fully integrated corporate strategic model. This transformation becomes possible when IT evolves from its technological heritage into a Business Technical Organization, or an “internal service provider.” This paper describes how the itSM Solutions reference model integrates five widely used service management domains to create a powerful model to guide IT in its journey into the business leadership circle. Entire Contents itSM Solutions® LLC. All Rights Reserved. The APMG-International ISO/IEC 20000 and Swirl Device logo is a trade mark of The APM Group Limited.